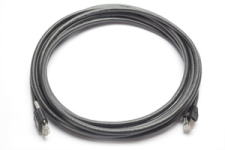 This Category 6 cable is designed for installations where the cable is frequently flexing about one axis. One end has a RJ45 connector that can be screwed into the camera housing to help keep it from coming loose. The other end has a RJ45 shielded plug with boot. RoHS compliant. Stated length is tip-to-tip.